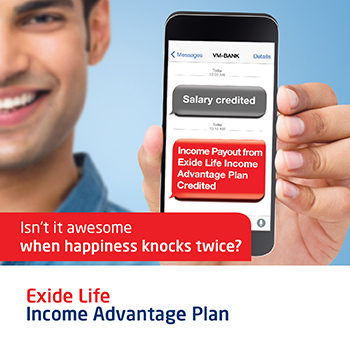 Exide Life Income Advantage Plan is a customizable savings plan which offers you with Guaranteed Income and Insurance cover under the same plan. The plan primarily aims at providing additional income option to meet future financial requirements. It is a Traditional Participating Insurance Plan which will provide you with regular payouts in the latter half of the policy tenure while you need to pay the premium only during the 1st half of the policy tenure. It is an ideal plan for individuals who are looking for an Insurance cover along with an additional income to meet future goals such as Child Education expenses or to take better care of your loved ones. The Cost of Living is always on the rise and the meager annual increments are just not enough to meet your expenses and allow you live a life you deserve. In such a situation if one is burdened with additional cost involved in supporting your family, providing your child with the best of education and improving your social status, it becomes very difficult to manage. Thus additional income does help to meet such needs and provide oneself and your loved ones with a comfortable living. Young Individuals may find their present income to be sufficient. But things quickly change when they are faced with additional responsibility of starting their family, taking care of their ageing parents and at the same time improvising on their standard of living. Thus, in order to take care of such scenarios one needs to plan early and properly. It is always advisable to have an additional source of income which will supplement your regular income. Planning for future not only helps you mitigate your burden but also allow your dreams to take shape and get fulfilled. Exide Life Income Advantage Plan requires you to pay only during the first half, ideally when you don’t have much of financial obligations and pays you Guaranteed Income during the later half when you are in much need of funds to accomplish your goals. Policy comes with flexible payout options which Policyholders are free to chose based on their requirements. Future can never be predicted and it always advisable to prepare for unforeseen circumstances. Life is uncertain and there is nothing much we can do about it but we should never ignore the things which we can do. We can always safeguard the future of loved ones by providing them financial security just in case anything untoward happens to us. Therefore, Life Insurance cover is essential and in my opinion a must for every individual. This will not only help the ones we leave behind to sustain themselves but also accomplish unfulfilled dreams. With Exide Life Income Advantage Plan we are not only assured of additional income but also get a life cover for the entire policy term. The real advantage with this plan is you get the benefit of 3 in 1. First, when we start paying the premium towards the policy it teaches us the importance of saving for the future and we develop a habit to save. In the later half, the Guaranteed Income ensures you are able to meet your financial goals while the Life cover for the entire tenure ensures that your loved ones are financial secured. It is a comprehensive plan which ensures Policyholders future financial needs are taken due care along with complete cover. The plan is not only designed to meet the needs of working individuals, but is also aimed at ones looking for an income plan post retirement. Most retirees have to be dependent on the paltry pension or at the most can go for Annuity Plans, which do provide regular payouts but are not tax efficient and also don’t come with life cover. However, with Life Income Plan you are assured of guaranteed payout which is tax free along with the life cover. Individuals can plan for their retirement with this plan as it is very affordable and offers flexible payouts along with life cover. The policy is being offered for tenures of 16 years, 24 years and 30 years and two income payout options are available to the individuals. Insurance cover will continue for the entire tenure opted under the plan. On successful payment of due premiums, Annual Guaranteed Income (GI) is paid with Simple Revisionary Bonus and Special Additional Bonus announced annually based on certain parameters and performance of the plan. a.) Pure Income Benefit Option: Under this plan, One is entitled to receive the regular guaranteed income along with applicable bonuses every year during the benefit payout period. b.) Income with Maturity Benefit Option: Individualavail guaranteed income during the benefit payout period and all applicable bonuses accumulated over the period of time are paid as maturity benefit. Loan is also available against the Policy subject to provisions laid out in the terms and conditions. Discount is also available for Individuals opting for on High Premium amount. Rider Sum Assured will be less than or Equal to the Base Policy Sum Assured on Death. The premium amount paid towards the policy is eligible for Tax Deduction U/S 80C. Survival and Maturity Benefits are exempted from Tax U/S 10 (10) provided Sum Assured on Death is 10 times or more than the annual premium. Thus it is a tax efficient plan. If you consider Annuity Plans, payouts are fully taxable and no insurance cover is provided. The Plan is at par with other Traditional Participating Insurance Plans and offers guaranteed income. The return may not be at par with other Investment product available in the market as it is not a pure investment plan. As it needs to make provision for mortality charges and guaranteed payouts to the policyholders. Thus the policy is meant for Individuals looking for a risk free plan offering additional income stream along with insurance cover. *Please read the offer/policy brochure in details and consult your Financial Advisor before investing. **You are also advised to check the claim settlement record of the company before investing. However, with recent amendments to Insurance Act it is not very important. Note: This article has been sponsored by the respective Business House.